On April 14, 1979 a major uprising erupted in Monrovia as police attempted to suppress a planned early morning demonstration march against the proposed rice price increase. 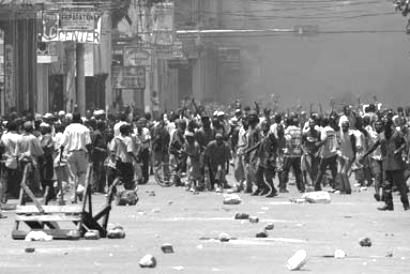 The Rice Riots (also known as the “riots for rice and rights”) or “the day Monrovia stood still”occurred during Easter Weekend, which had major religious and symbolic significance in this predominantly Christian country, including the obvious reference to the metaphorical resurrection of Jesus Christ on Easter Sunday. the Mano River Union (MRU), President Tolbert called on Guinean troops to restore order in the aftermath of the riots. People destroy their own homes.... for what? a shadow of things to come, and who would have known 40 years later the struggle continues.